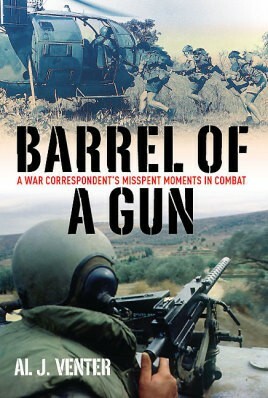 “Anybody who says that the pen is mightier than the sword hasn’t spent time in Somalia, or in Beirut during its bloody heyday.” So begins this fascinating memoir of a journalist, filmmaker, and just plain raconteur who has made a career of examining warfare—on the ground and as the bullets are flying. While the average citizen is aware of violent conflicts broiling all around the globe, Al J. Venter—from some strange compulsion unexplainable even by him—has felt the need to see them all in person, preferably at the center of the action. Born in South Africa, Venter has found no shortage of horrific battles on his own continent, from Rhodesia to Biafra, and Angola to Somalia. He has ridden with the legendary merc group Executive Outcomes, jumped into combat with South Africa’s crack Parachute Regiment (the Parabats), and traipsed the jungles with both guerrillas and national troops under whichever strongman in the country then held power. During Sierra Leone’s civil war he flew in the government’s lone Mi-24 Hind gunship as it blasted apart rebel villages and convoys, his complaint being that the Soviet-made craft leaked when it rained. In the Mideast he went into southern Lebanon with the invading Israeli army as it encountered resistance from multiple Muslim groups, including the newly formed Hezbollah. Curious about the other side of the hill, he joined up with General Aoun’s Christian militias while that conflict was at its height. Touching down in Croatia during the Balkan wars, and in Congo during their perpetual one, as well as the Uganda of Idi Amin, Venter never lost his lust for action, even as he sometimes had to put down his camera or notebook to pick up an AK-47. In his journeys, Venter associated with an array of similarly daring soldiers and journalists, from “Mad Mike” Hoare to Danny Pearl, as well as elite soldiers from around the world, many of whom, he sadly relates, never emerged from the war zones they entered. The creator of countless documentaries and books, from warfare to shark diving to nuclear proliferation, Al Venter has here offered the reader his own personal combat experiences, in all their multi-faceted fascination.